Contrary to popular talking points, digital transformation is not a process in and of itself. Instead, transformation represents a broader industry shift towards encouraging greater technology adoption and more sophisticated business outcomes, including customer satisfaction and lower operation costs. 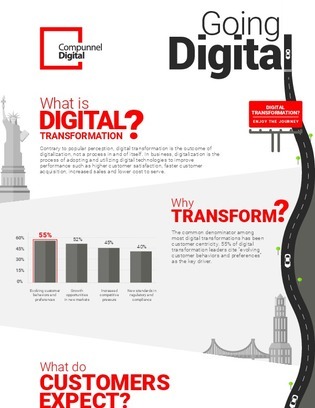 Click inside to trace through the roadmap of digital transformation, including a look at how the concept has evolved over time and tips on what a business in its throes can expect. From roadblocks to opportunities, you’ll get a chance to glance over the common shapes digital transformation initiatives can take.